Statistics show that most cat owners have more than one cat. Yet another study found that behavior problems increase with the number of cats in the family. Research also shows that cats sometimes live indoors at densities as much as 100 times greater than that of free ranging cats. No wonder cats in multi-cat families are prone to behavior problems! Social conflict among cats is a common source of stress. Research from the veterinary community has established a link between chronic stress and certain medical and behavioral problems. You can avoid many behavior problems that develop in a multi-cat family as a result of social conflict by following the recommendations in Helping Kitties Co-Exist. Our Helping Kitties Co-Exist program gives you solid strategies to help avoid conflict and promote positive social relationships. Do you know, for example, how crucial first impressions and well-managed introductions are for helping cats create friendships? Do you know the most common mistakes made during introductions that can prevent some cats from ever getting along with one another? Are you thinking of adding another cat to your family? Or do you have questions or concerns about the existing relationships in your multi-cat household? Is your home optimized to minimize conflicts among your cats? You’ll find the answers to these questions and many more in Helping Kitties Co-exist. This program will give you the detailed instructions you need to do successful cat introductions and re-introductions. But this is only a small part of the valuable information you’ll find in this program. You’ll also learn what the latest research has revealed about cat social behavior and what this means to you in helping your cats get along. With topics ranging from choosing a new companion for kitty, managing introductions, minimizing conflict through environmental design, and what to do should problems arise, Helping Cats Co-Exist is an invaluable tool for any cat lover. We’ve provided you with a sample of Helping Kitties Co-Exist right on this page. This video is the introductory section of our DVD. 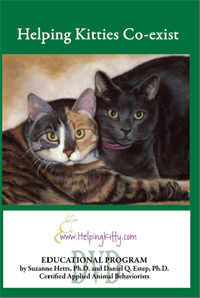 Helping Kitties Co-exist is available in both DVD and audio formats. CLAIM YOUR COPY TODAY so you can promote peace and well being among your feline family members.